Immediate Occupancy. Renovated and ready to move into! 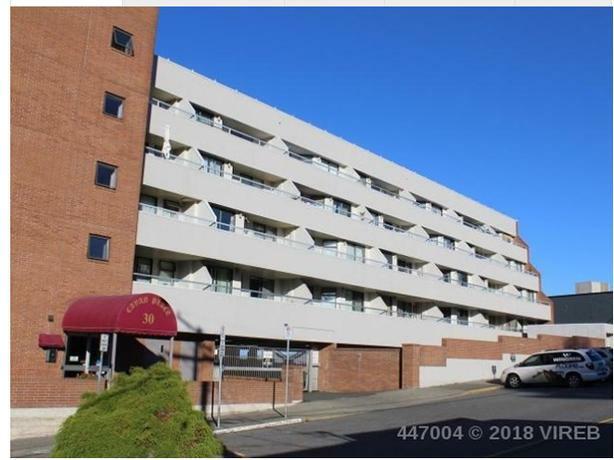 Here is a great opportunity to own this sharply priced 2 bedroom 1 bath condo on the third floor of Cavan Place, facing west, with a BIG balcony to enjoy the sunny exposure. This suite offers a spacious living and dining room area with sliding glass doors that lead to the living outdoor area. The kitchen has plenty of cabinets & counter space, the master bedroom is large and you will love the convenience of the in suite laundry. The bathtub was removed and a full five foot shower was installed.This well managed concrete and steel building offers a secured entrance and secured parking and is located in the heart of downtown Nanaimo within walking distance to the seaplane terminal 17 min to downtown. Vancouver, Port Place Mall, Convention Center, The Port Theatre & Swy-a-lana Lagoon Seawall and everything downtown Nanaimo has to offer. Meas approximate. No pets; rentals allowed.